LMS & Udemy for Business: a milestone initiative for INTRASOFT International | Intrasoft International S.A.
At INTRASOFT we have always believed that, our people are the main driving force behind all of our success. INTRASOFT people lead us towards growth with their unique and inspiring views and ideas. That’s why we strive to create an environment that helps them evolve and grow into their potential. 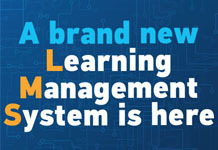 Part of our strategy is the expansion of our organization’s learning culture and we are proud to announce the launch of a New Learning Management System (LMS), supported by SuccessFactors cloud application. We are expanding our employee’s knowledge and know-how by providing them with better learning opportunities that will enhance their skills, promote their personal growth and boost their self-development. The business world is under a unique shift, where occupations and industries are evolving and expanding, and the skills required to keep up are everchanging. Inspired by this change, INTRASOFT International is the first organization in Greece (and among a small number of organizations in Europe) that has invested in a brand-new LMS integrated with Udemy for Business. We have acquired paid licenses to this cloud-based platform, 1 for each employee, that obtain access to 2.500 online courses, tailored to meet each employee’s unique needs for knowledge and development. The system facilitates the planning, management, delivery and measurement of INTRASOFT International's learning activities. #IntrasoftPeople can meet their professional and personal objectives, given the flexibility to join the online courses whenever they wish, through their personal license. Strategic-wise, adopting and investing in this new LMS is a milestone initiative for INTRASOFT, since it unfolds a new chapter on the company’s learning culture. Lifelong learning helps people unlock their true potential, improve their skill while gaining the confidence to walk the extra miles. Just ask #IntrasoftPeople, they will confirm!